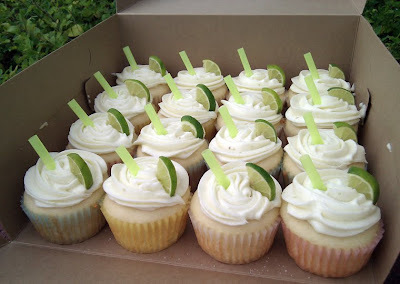 ...especially when you're sipping on refreshing margaritas poolside or, better yet, indulging in a margarita cupcake. What we have here are tequila-spiked cupcakes brushed con mas tequila, topped with tangy lime cream cheese frosting, and garnished with a fresh lime wedge, an inedible (but oh so cute!) straw, and a sprinkle of course sea salt for good measure. Thanks Heather, for the opportunity to whip these up for your officemate's farewell party. Best of luck to her on her new adventure, and warm summertime wishes of fun, sunshine, and sweet treats to all!